Dr. Ekwenna is an attending urologist at Riverside Medical Center in Chicago, IL, with affiliations at Rush University Health System and University of Miami Transplant Institute. He is a trained kidney and liver transplant surgeon and his interests include expanding access to transplant services to health care centers in Africa. • Volunteer urologist with Medics on a Mission, Inc.
Dr. Opara is an assistant professor at Wayne State University School of Medicine with joint appointments in the departments of Internal Medicine and Pediatrics. She is also the Global Health Director of the Internal Medicine and MedPeds residency programs. 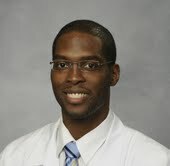 Dr. Cooper is a fourth year resident physician at University of Miami (Jackson Memorial Hospital) in the Department of Internal Medicine and Pediatrics. She has an MPH in Global Health and Population from the Harvard School of Public Health and her primary career interests are academic medicine in resource-poor settings and health systems strengthening. Dr. Anwisye is a third year resident physician at St. Louis University School of Medicine in the Department of Family and Community Medicine. She has an MPH in Family and Community Health from the Harvard School of Public health and has a keen interest in child and maternal health. • Teaching and evaluation of the Helping Babies Breathe curriculum (basic neonatal resuscitation for resource-poor areas) in Mthatha, Eastern Cape, South Africa. Dr. Easterling is an Assistant Professor at the Rutgers New Jersey Medical School in the Departments of Family Medicine and Preventative Medicine & Community Health. He is also the Faculty Director at the Student Family Health Care Center and the Assistant Clerkship Director for the 3rd year Family Medicine Clerkship. Dr. Ozoude is an Assistant Professor of Orthopaedic Surgery and Sports Medicine at the University of Texas Health Science Center at Houston (UT Health). Interested in joining or participating?